You are here: Home / General Wellness / Why did I rebrand dietfitnessdeck.com to slickwellness.com? 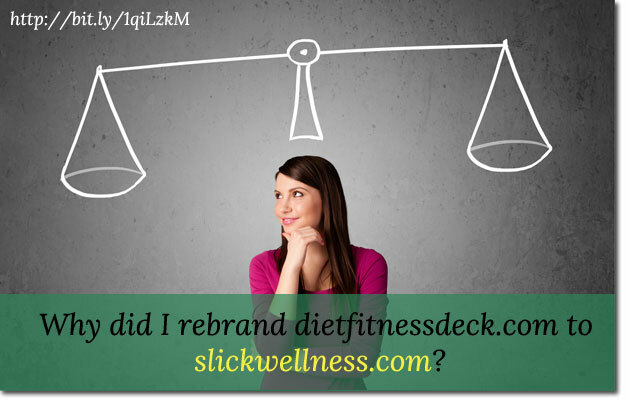 Why did I rebrand dietfitnessdeck.com to slickwellness.com? If you have been following me for a while you probably know I own a bunch of blogs. I have quite some varied interests and I cannot hold on to one particular interest (that’s pretty human I suppose – and not at all surprising). I have blogs on blogging niche, love and relationships niche, personal development niche and so on. And I have various other sites that represent my other businesses like web hosting and designing, and my personal blog where I just write my own reflections and thoughts. One such niche that I got interested a few years ago was the health niche. So I started dietfitnessdeck.com. It all started well and went very well. Even now, the site does pretty well in terms of traffic, and income (at the time of writing this post, when I’ve just bought the slickwellness.com domain and haven’t changed the site, yet). So why did I re-brand dietfitnessdeck.com? There are quite some reasons which I discuss below. First of all, the older site “Diet Fitness Deck” is aligned to more of fitness – as in exercising, building muscles and all that kinda tough stuff. While I am not against women doing weights and building muscles, it is not my thing. But you may ask: Then why did you start Diet Fitness Deck in the first place, Jane? Good question! And, here’s my answer – My hubby used to co-write with me on that blog where he took care of the fitness bit. Now he has a more intensive day job and has no time to contribute. In addition, I find myself more and more aligned the the new categories introduced here at this blog. I can do real justice only if I write about something that I am interested in. Coz otherwise, even if the posts are useful, they won’t have life. I don’t like my blog to be a lifeless one. I will be republishing some posts from the old site with after giving them a proper uplift. I want to truly communicate with my readers and if I write on a topic in which I am not interested in I cannot communicate! It was a no-brainer for me. So what’s in it for you on this re-branding? Well, you can read more personalized posts that have my own voice and my own experience and my own tips that I learned from my own experience – whoa! If you want me to write about any specific topic on these categories, please feel free to submit your request here. Remember I want this blog to be highly useful and engaging. And one key thing to do it is to deliver what you want. And what do you want? Just let me know here!